In January, 2019, Feeding Avery Families converted to a “Client Selection” approach. Previously, prepacked food boxes with items we selected were passed out to those who needed them. In the new “client selection” system, each person fills their own box in a process that is much like shopping in a grocery store. The new system allows each person to tailor what they receive to their individual needs and preferences. 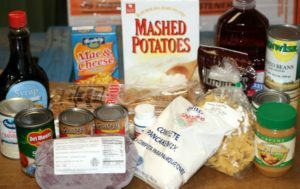 Food is distributed from the Feeding Avery Families Distribution Center located at 508 Pineola Street in Newland, NC.